In our recent paper on income growth and financial services, Elisabeth Rhyne and I argued that as people’s incomes rise, so does demand. Soon after we published the paper, protests began in Brazil. Many are citing this social movement as the result of increased economic growth and prosperity. When we look closely at those protesting, we see that the majority of the protesters may not even be middle class. Instead many, if not most, are in the “vulnerable class,” with incomes between approximately $4 and $10 per day. Last week, the Center for Global Development wrote a blog post that highlights the findings from their forthcoming paper on the growing vulnerable class in Brazil. Nancy Birdsall holds that this vulnerable class is demanding more and better public services such as infrastructure, education, and health, consistent with our own hypothesis linking income growth and demand. “Sorry for the nuisance: we are changing Brazil,” reads the sign carried by a young woman marching down the streets of São Paolo on June 17. So who is this “we” she refers to? Fellow protestors, certainly. But “we” might also refer to the large, frustrated group of “strugglers” in Brazil—those who are no longer poor—but have income still too low to be part of Brazil’s new middle class. In a revolution of rising expectations they are demanding a better government. 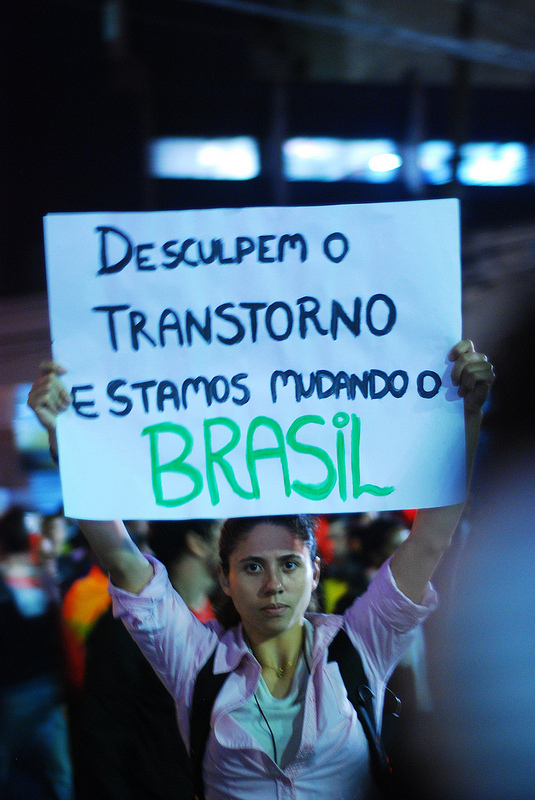 Their demands put Brazil’s still-young democracy (the military withdrew less than 30 years ago) at a crossroads. If their evolving needs and demands are met, they will have acted as agents of inclusive growth and change in their society. If their problems are neglected and they lack sufficient schooling, skills, and opportunities, they could become a restive underclass, and likely supporters of populism and civil strife. But now it seems this is not enough. For nearly three weeks, Brazil has experienced the biggest nationwide street protests since the early 1990s, when a frustrated society demanded the impeachment of then-president Collor de Mello. Back in 1992, the reason for the national public outrage was a large corruption scandal and chronically high inflation that eventually turned into hyperinflation. Two decades later, ascommentators point out, there is no shortage of reasons why some 1 million or so Brazilians have taken to the streets: corruption, high rates of crime, rising consumer prices, resentment about big public spending on the upcoming soccer World Cup, and—perhaps most importantly—the low quality of public services in infrastructure, health and education. Read more on the Center for Global Development’s blog.